In a world that views absolute truth and divine judgment as being either outdated or subject to one's own definition, the need for Christians to read the Bible is critical. 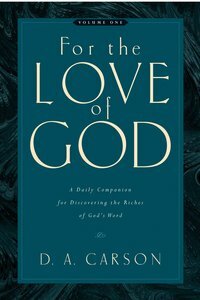 About "For the Love of God (Vol 1)"
^As with its companion volume, For the Love of God--Volume 2, this devotional contains a systematic 365-day plan, based on the M'Cheyne Bible-reading schedule, that will in the course of a year guide you through the New Testament and Psalms twice and the rest of the Old Testament once. ^In an effort to help preserve biblical thinking and living, D. A. Carson has also written thought-provoking comments and reflections regarding each day's scriptural passages.